Capturing a screen capture on your Windows PC is done by a key combination on your keyboard while on a Windows Phone it is done via a key combination on the device. But what about a Windows tablet? Actually it is pretty easy to do but it is one of those things that isn’t document very well and it could be easily missed. In this How To I’ll show you how to do a screen capture on your Windows tablet and will show you where those files are stored so you can edit them or move them to another folder including OneDrive. The first question though is why do you need a key combination and not use the keyboard combination like you do on a Windows PC? Well, it’s pretty straightforward actually. To capture a screen shot on your Windows PC you press Windows Key + PrtScn. No go take a look at the keyboard on your Windows Tablet… ah! No PrtScn button! There you go. That’s why Microsoft had to come up with a solution for Windows tablets other than a keyboard combination. To capture your screen on a Window tablet, press the Windows Key + Volume Down button. Be sure to press the Windows Key first, hold it down, then press the Volume Down button. Your screen will dim slightly which will give you the indication that a screen shot has happened. Screenshots. Open that up and there you will see your screenshot that you have captured. In my case, the directory is This PC > Pictures > Screenshots. Now you can simply tap-and-hold the file and drag it to anywhere on your tablet or to your OneDrive folder to share it across your devices. This How To should work on any Windows Tablet that has a Windows Key and a Volume Down key. I tried this on my Toshiba Encore 2, a HP Stream 7 and HP Stream 8 as well as a Surface Pro 3. Hi, I tried on my HP Stream 8 but it didnt work. I pressed and hold the Windows button and then press Vol Down key. Nothing happens. Do I need to set anything prior to that? That is all you need to do. Make sure you are holding the Windows key down first, then press the volume down button. Thanks for the reply. But the Windows button is not a physical button, a touch-button only. I hold it as in touch it and press the Vol down button. The only thing happened was the volume went down. Oppss, just saw this from HP forum. I understand you’re looking for information on taking screenshots with the Stream 8 tablet. The shortcut you listed for Windows tablets does not work on the Stream 8. To take screenshots of desktop apps you will need to use the Snipping Tool. 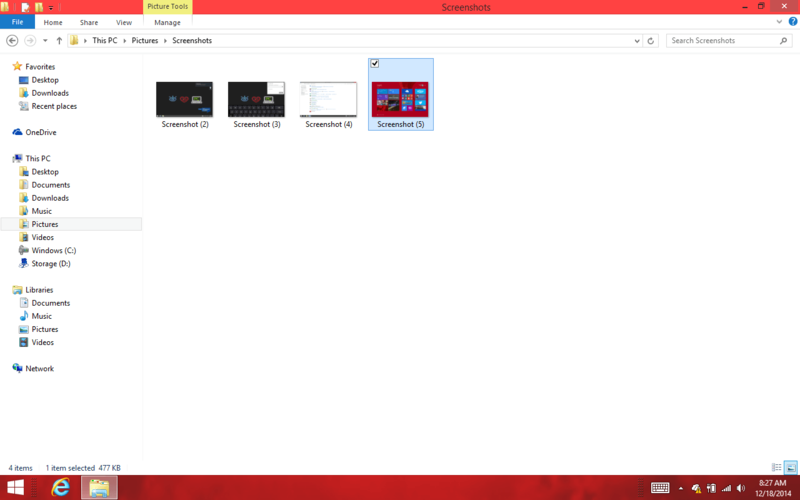 You can find this by searching Snipping Tool in the start screen. If you want to share a screenshot of an app you can use the screenshot feature by swiping in from the right, selecting Share, and changing the dropdown at the top right corner to Screenshot and then selecting how to share the screenshot. Choices here are limited, and personally I use Mail to share a .png image by sending it to myself so that I can do what I need with the screenshot.